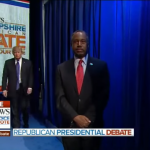 First, Carson waits by himself. A stage hand tells him to go, but he thinks he shouldn’t and stays. 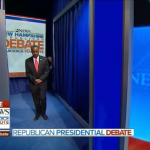 Cruz walks past, himself wondering what’s going on. 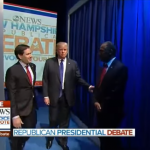 Trump misses his call and greets Carson as Rubio walks past. With not much else to do, the two smile for the camera. 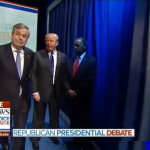 Jeb waits what seemed to be a long time in the background, finally giving Trump a jocular nudge to the side, then shrugs as he walks past and out on stage, displaying what one might expect to see in corporate American office buildings. 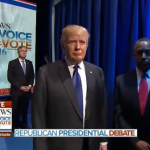 Trump and Carson somewhat scowl, probably more in curiosity than anger. Most of the time they just smiled, not caring much at all. 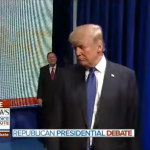 Carson’s name is called a third or fourth time, which he finally hears, leaving Trump with John Kasich standing, smiling, way behind him. 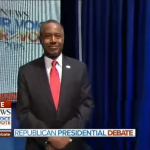 Carson and Trump are the non-professional politicians. They can’t hear the media because the people are too loud. The establishment stands behind them. The “cool kids” walk past them, sometimes brushing them to the side. 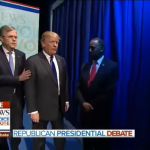 Others think Carson and Trump missed something. 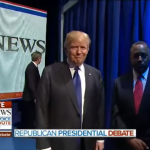 Maybe they did, but, throughout the drama, Carson and Trump stand together. 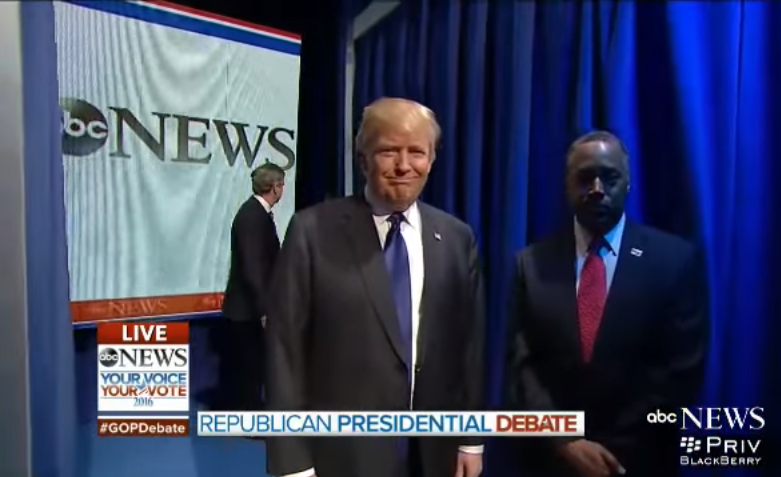 Of the two, while Carson got in first, Trump was the last one standing. There is a lot more that could be said. I put some screen captures at the end of this post for fair use and comment. 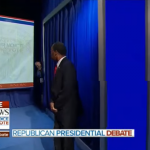 As for the debate itself, I think we got some “ABCs” of politics. In a word, “telling”. Rubio and Christie really went at it. Neither stand a chance as both played games with Obama—Christie with his hugs and Rubio with his freshmen gang of eight. But, politics is being exposed for what it was. Cruz gave a gutless apology—just an apology, very sincerely, while he still benefits from others mistakes he is not correcting. He won’t get the religious vote that way, but it seems a frequent thing for his part. Kasich is too far out, like Christie and Jeb. We all know the side-effects elections have on professional politicians; forgotten promises and other symptoms. Other than the two rookie champs who smiled together, governors and senators fill the stage. 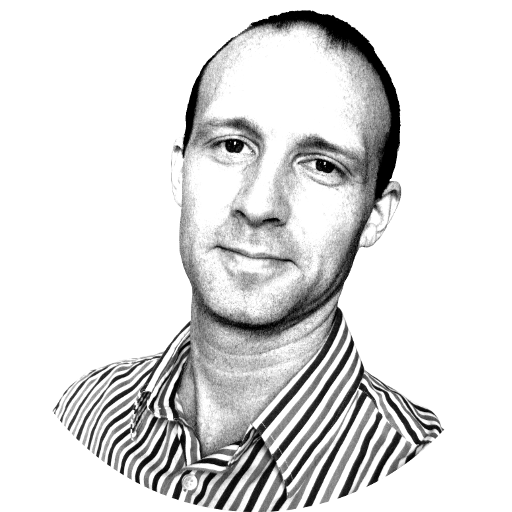 If any of those other professionals get elected, they will probably stop saying all the good things they say. It would be better to keep Cruz and Rubio, and why not Paul also, in the Senate. There, they will probably keep up their wise rhetoric where it is badly needed. Kasich, Jeb, and Christie would also make a positive impact on the country while Trump does actually does what they have been talking about and the senators get a new leader: a brain surgeon. That’s what I’d like to see, anyhow. Call it wishful thinking. As a side thought, thinking in demographic and superstitions terms that I hate thinking in. I really don’t think this way, but some people do. 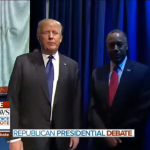 So, try hard with me and imagine: Trump-Carson v Hillary/Sanders-??????. 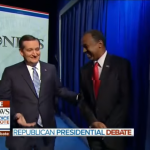 With Trump and Carson, Neither are politicians, one of them a brain surgeon as the first Black Vice President, the other a profitable job-creator who hires women and Hispanics and isn’t owned by the elites. With the need to solve racism, address health care, and fix the economy, what could a ticket involving Hillary OR Sanders possibly to do “trump” that?